Place the cabbage, carrots, red peppers and spring onions in a large salad bowl. Toss until vegetables are well-mixed. In a small mixing bowl, whisk together the remaining ingredients. Pour over the cabbage salad, and toss again to coat the salad evenly with the dressing. Refrigerate this salad until you are ready to serve it. We were looking for an Asian salad to go with gyoza. If you aren't familar with gyoza, it is an asian dumpling. (Misty will have to post Dave's family recipe, it is FABULOUS!!) This salad has a great kick to it and Greg and I both loved it. Great to see you here Angel! I'm always looking for good side dishes. 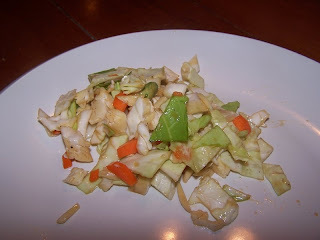 I love this salad, and I usually add Ramen noodles(or other Asian noodles, shredded chicken breast, and sesame seeds.